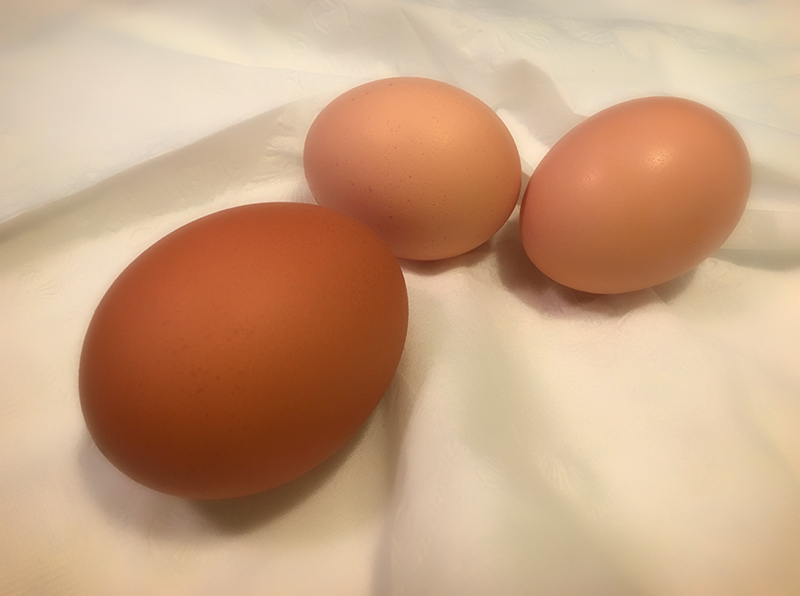 One of our Farmer Friend’s Large Chicken Egg, vs. our two TINY Chicken Eggs. The New Hampshires in their Teen Years. I am joyously grateful. Please. Don’t get me wrong. You see, yesterday, we found our first chicken egg. It has been a learning experience thus far. Perhaps, that is my biggest understatement of 2015. We have run the gamut with these chickens. And while we started out with 19 chickens, we now have a flock of 8. We gave away a lot of roosters. A LOT. But we have lost a few chickens too. And that has been hard on this new Chicken Family. We have washed pasty butts. Tackled chickens for their own dang good. Worked on desegregation issues. Fought hard for equal rights for all chickens. We read them bedtime stories, and let them watch Chicken Run on Saturday nights. 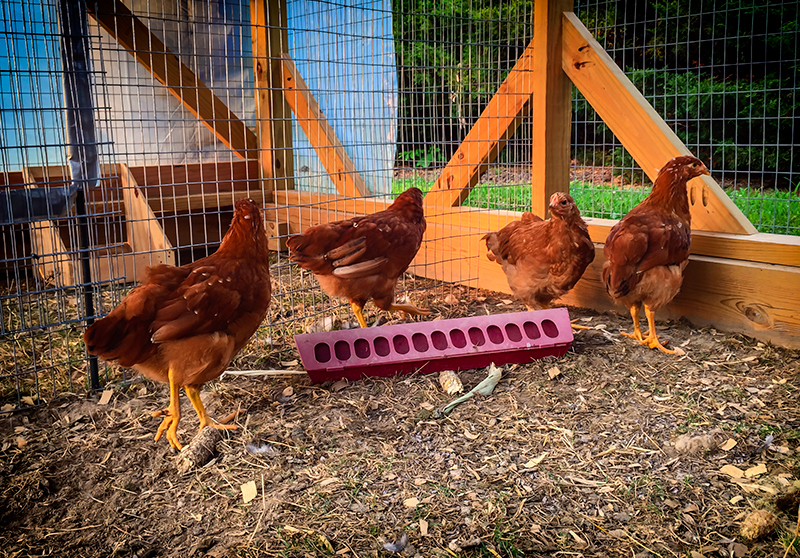 We have built them a custom coop, and given them a very large yard. In fact, they have taken to daily visits to the pool area. The other day I saw two sitting out in the pool house, looking at the gas grill. I can only imagine what they were thinking. But back to point. I am grateful. For that very first egg. In fact, it seemed to be too good to be true. And as they say… if it SEEMS to good to be true, it probably is. So, I was expecting this to be a fluke of our non-egg-bearing chickens. A one-time freak show. A lone miracle of nature. Low an Behold. This morning, we found a second egg. One can’t help to do a little jig-of-all-jigs at the spotting of a new egg. And I do. So when I tell you this, please take it lightly. Our chickens are making TINY eggs. Now. I already eat three large chicken eggs each morning for breakfast. I have the same thing, every day, truth be told. Three eggs. A couple pieces of ham. An English Muffin. And… a large bowl of oatmeal. Most people don’t believe I eat the big breakfast that I do. But I do. Here is my worry. I will have to eat at least five eggs… if they are this small. Now… I really won’t like to tell people I eat 5 eggs each morning. Albeit, my cholesterol is unfairly low. It is about 120. But if I am having 5 chicken eggs, we are going to have to get more chickens. I can only see this as a troubling prospect. I guess I can continue to outsource. In fact, that may be the best thing. But as you can see…. this would be a huge matter for anyone as serious as I am….about their chicken eggs. So. Before I go into Shell-Shock… I really must hatch a plan. Eggsactly what you were thinking too? As long as we don’t ruffle anyone’s feathers. It has to be a GOOD plan. Not some bird brained idea. Again, as we see with life… there are NO easy answers. Soooooo… for now…. I have to make like a chicken, and get the cluck out of here.